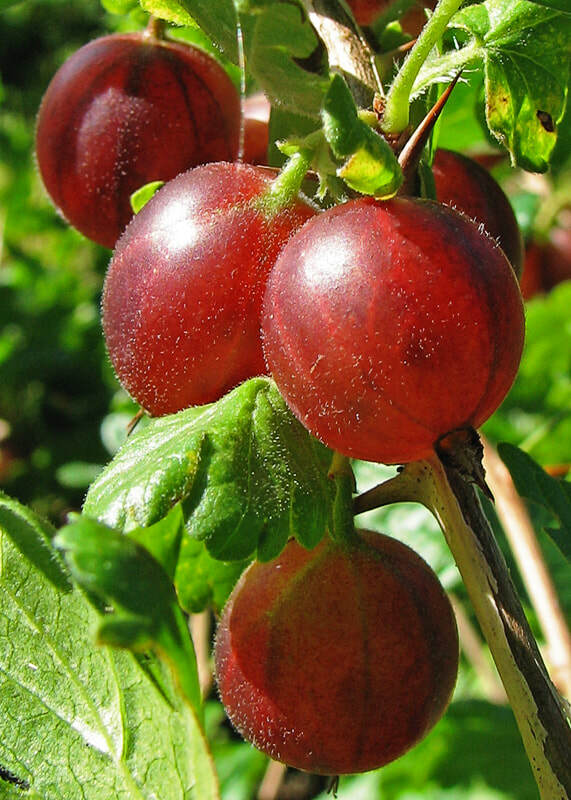 Red gooseberry is a spiny shrub native to Europe. It produces clusters of just a few pinkish-yellow flowers and unusual, bristly fruits that look like small, furry grapes. Despite their hairy-bristly covering, the fruits are delicious especially when fully ripe. They are quite tolerant of shade, although will not bear as much fruit in these conditions. Likewise they do not like very hot conditions, succeeding best in cooler, moist climates, To order this plant please contact us balkanecologyproject@gmail.com. ​The fresh leaves contain the toxin hydrogen cyanide. This substance is found in several foods, including almonds. In small quantities, hydrogen cyanide has been shown to stimulate respiration and improve digestion, it is also claimed to be of benefit in the treatment of cancer. In excess, however, it can cause respiratory failure and even death. In Flower from March to May, and fruits from July to September. Fruit:If the fruit is allowed to remain on the plant until fully ripe and soft it becomes quite sweet and is delicious for eating raw. Leaves: Attractive, 3 lobed. Although used medicinally, refer to known hazards.